I made a batch of my Pomegranate Molasses recently to tackle my version of a Persian recipe called Fesenjan…which I will get to someday, but decided instead to knock out a holiday-inspired chicken dish that ended up being better than I had imagined! Not overly sweet, fall off the bone tender, and has a slight smokey taste from the andouille… as well as a punch of heat for the arbol chilis. Take this recipe as it is, and it makes an excellent entree for any holiday dinner party that you are having. If you have game bird hunters in your family as I do, I think this would be wonderful with pheasant, grouse, and duck. Just an idea, and if you do try it with game fowl, please let me know… I would love to hear how it went! In a cold dutch oven or heavy high sided skillet that is oven proof add a few glugs of grapeseed oil along with the diced andouille sausage. 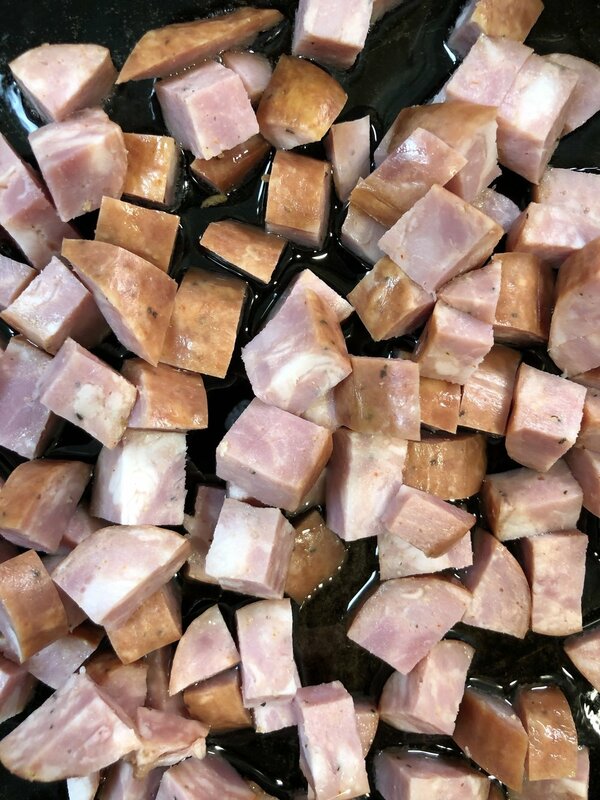 We not only want to crisp up the andouille but also render out all that flavorful fat. Starting sausage, salt pork, bacon, or lardons out in a cold pan renders out more fat. Heat slowly. Once the sausage starts cooking and rendering on medium-high heat, stir the andouille around to make sure it crisps up evenly. Once browned remove the sausage to a plate leaving the oil and rendered fat behind. Pat the chicken thighs dry with a paper towel. Season well with the Cook’s Line or kosher salt and black pepper. Lay the chicken thighs down gently, skin side down, into the hot pan and renderings. Cook the chicken thighs until the skin is crispy and golden brown around 5-6 minutes. Gently turn the thighs over to sear the other side for around 3 minutes. Remove the thighs to a plate. Pour out the excess rendering from the pan leaving around one tablespoon behind. Turn the heat down for the pan because we are going to sauté the onions and garlic along with the arbol chilis. Too high of temperature on the pan will burn the onions and garlic. Add the onions and garlic to sauté… this also “deglazes” the pan adding all that cooked sausage and chicken flavor to the onions. Snap the arbol chilis in half and add to the pan…stir around to combine and cook. Heat your oven to 325 degrees. Once the onions and garlic are tender add the chicken thighs back to the ban, skin side up. Add in the crispy andouille and skater it around to fill in the gaps between the chicken. Pour in the chicken stock, followed up with the pomegranate molasses. Stir the liquids around as best you can. Cover the dutch oven skillet with a lid and place in the oven. Cook covered for one hour. After one hour remove the lid and continue cooking the chicken for an additional 45 minutes or until the liquid has reduced slightly and the chicken is caramelized and beautiful on top. Serve the entire pan family style, or carefully remove the chicken to a platter… it is fall off the bone tender by now. Add the jus from the pan along with the diced andouille. Sprinkle the top with chopped parsley and fresh pomegranate seeds before serving. Enjoy! *Also great in cocktail recipes. It's the original "Grenadine Syrup"
in a large saucepan, heat all the ingredients to a high simmer until sugar is dissolved. Lower the temp, and slowly simmer for about an hour, or until the mixture is reduced down to a syrup (about 1-1 1/2 cups). Pour into a jar, and let cool. Refrigerate until needed.